For a long time testing and test driven development (TDD) was kind of a magical thing to me. I didn’t really know what it meant and it seemed to be something only “real” developers can do correctly. Many developers suffer from imposter syndrome and so did (sometimes even today do) I and I was too scared to get into this magical thing called TDD. Up until this day I’m still learning how to do this testing thing correctly and most of the time I still write my tests after I wrote the code (so I actually don’t do TDD). For the longest time I did quite some things wrong when writing tests for my projects. I didn’t get that you have to actually write testable code in order to write good tests for it. Let’s take the following code from my most recent project (loading-comparison) as an example. Whats wrong with this code when it comes to testability? The formatValues function depends on functions in the global scope (chalk and Math). Why is this bad? When testing this function we are limited in what we can test. In fact we can only test the output of the function. If we change something and the test fails, the only thing we know is that something is wrong but not exactly what. We are not able to determine if the Math or the chalk functions are called with the correct values or if they are called at all. So let’s rebuild the formatValues function using the TDD approach. Although I’m used to mocha, sometimes I want to try new stuff and I choose ava to experiment with. Why ava? It is new and has 8.700 stars on GitHub, so it must be good, right? Let’s install ava and Sinon.JS and add a new test script to our package.json file to get started. Because we are real developers who only do real TDD, we start with creating our first test before we are writing any actual code. This might seem like a silly test, obviously we need a function and obviously there will be a function formatValues once we define it. So yeah, you may not write tests for the existence of the function itself in your codebase, but I like the idea of having tests documenting the code. What this test is saying is: “In this codebase, there is a function called formatValues”. Although it might seem superfluous, it is a good habit to always run your tests (and see them fail) once you wrote a new test. That way you might catch an error in your test – if you wrote a new test and the test is not failing, something is wrong with your test (assuming you are doing TDD and write your tests before the actual code). Now we have a failing test – let’s make it succeed. Whats going on here? We are creating an empty function which takes an object literal as the first parameter (using the ES6 destructuring assignment syntax). And we define and export a factory function to bind the dependencies (which will come later) to our function and return it. It will become clearer what we are doing here in the next step, trust me. Usually you shouldn’t have to change your test after writing your code, but in this special case (because we created a new file) we have to update our test to import and use this new file. Let’s run the test and see it succeed. Our test succeeds and that’s great, but our code doesn’t do much. In fact, it does nothing at all, so let’s change that. But first, we add a new test, off course. What do we actually want to achieve with our little formatValues function? The formatValues function should take an array of values and return a new array with the min values of the array highlighted as bold and green when outputted in the terminal. The first step on the journey to achieve this goal is to find the min values in our array. The native Math.min() function does exactly that, except that it doesn’t take an array as parameter but all the values as multiple parameters. Luckily we can use the ES6 spread operator (...) to create multiple parameters from a single array. We want our function to call Math.min() with the parameters from an array. We use an object literal and sinon.spy() to create a fake Math.min() function. This enables us to spy on the fake function and detect if it was actually called. The test is ready, now we can make it succeed by updating our function. Now we know what our min values are. Let’s paint them with chalk. But not so fast, first things first: the test. We now have to fake both, chalk and Math. For chalk.bold.green() we use sinon.spy() again. For Math.min() we use a stub. Because we are smart people, we already know that the min value of [1, 2, 3] is 1 so we make Math.min() return 1. What we are testing is, if chalk.bold.green() is called with the determined min value of 1. After checking if our new test fails as expected, we update formatValues to do what our test says it should do. At this point we are almost done. The last thing we want our function to do is, to return the new array with the highlighted values. This time we make chalk.bold.green() return highlighted this should replace the min values of our array with highlighted and we can check it by testing if the array returned from formatValues equals the values in our expectedResult array. Currently we do not return anything in the formatValues function, let’s change that and make our final test succeed. Finally our function does what we expect it to do, all tests succeed and we feel great! 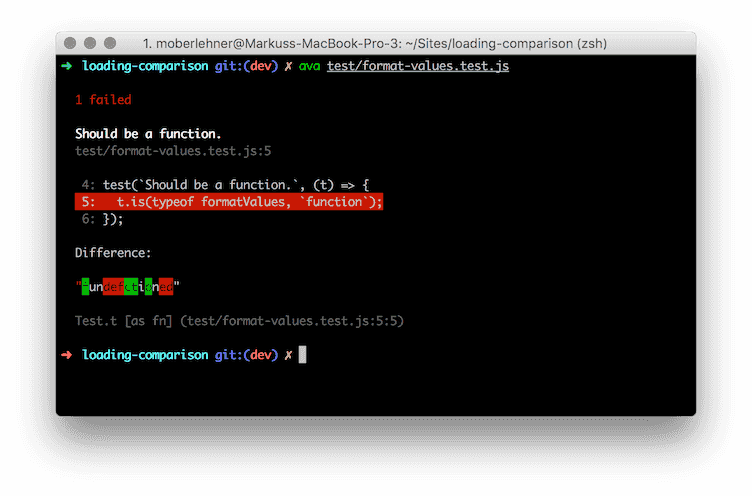 You may have noticed, that formatValuesFactory() is called for every test case. In your “real” codebase you won’t do that. The factory function is called only once or at most once in every controller or entry file or whatever, in your project. The reason why we do this in the test script is, because we want a clean environment for every test case. If we would call the factory function once at the beginning of the test file, and use the same returned function for every test case, there might be side effects caused by the way the (factory) function works. Because of the pure nature of our formatValues function, it doesn’t matter, we could use the same instance without fearing side effects but it is a good habit to always use new instances for every test case. TDD is fun but there are many things you can do wrong. There are many things I did and still do wrong, but the worst thing you can do is to not test at all.